Michael Michaelides’ gift for painting was acknowledged while he was still a student at the Pancyprian Gymnasium in Nicosia, where his teacher was the painter Adamantios Diamantis. After finishing school, he maintained his relationship with his teacher; he was a member of the Art Lovers’ Society, formed by Diamantis in 1943 and numbering amongst its ranks talented former students of his. The purpose of the Society was the further artistic education of its members; indeed, Michaelides took part in both the exhibitions it organised, in 1946 and 1948. It was only natural, therefore, that in these first artistic steps he took before beginning to study art, he should follow the teachings of Diamantis and focus his interest on the landscape and people of Cyprus. In some of Michaelides’ first works, one can also discern the influence of George Pol. Georghiou’s early works, which he obviously must have seen at the latter’s solo exhibition in 1950. 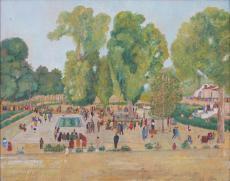 The Children’s Garden, Nicosia belongs to the painter’s early works. It depicts the first children’s playground created in Nicosia; the Children’s Garden, as it was known. It was in the moat of the Venetian Walls, just below Nicosia’s most central square – Eleftheria Square. As the only place where children could play and have fun, it was extremely popular and was always packed, especially on Sundays. Michaelides painted the Garden from above, from a certain point along the walls, presumably on a Sunday afternoon. 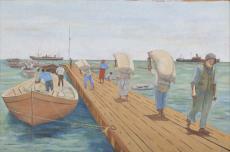 The artist created a panoramic view of the place, with people enjoying their time off work. Moreover, we are taken back in time, when citizens had few places and means of recreation available to them and the main streets of the city were the centre of the Sunday promenade. From a careful look at the way people were dressed, we can see that the promenade was enjoyed peacefully and without any kind of division by Greek-Cypriots and Turkish-Cypriots alike. The painting is divided into two parts. Along the bottom part there unfolds a multi-character scene from the life of the inhabitants of Nicosia – one of the few scenes of urban life to be found in contemporary Cypriot painting. The people are rendered on a small scale, in miniature, but descriptively and with much clarity. The numerous complementary elements and the profusion of detail lend the composition particular charm. This entire world, marked by a languid, slow pace, seems to disappear in the majesty and grandeur of the natural landscape which dominates, taking up the top part of the painting. The contrast in sizes used by Michaelides gives the work a distinctive style, monumentalising an ordinary genre painting.